Park Inn by Radisson Ekaterinburg is a hotel of 4 stars located in Ekaterinburg city centre within walking distance of the main business district and the popular shops. For all participants and guests of the exhibition it offers a special tariff for accommodation during working days of international tourism exhibition LETO-2018. Free transfer services are provided for participants of the exhibition. 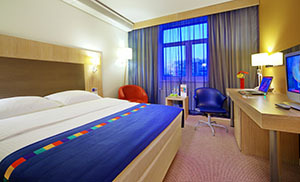 reservations.ekaterinburg@rezidorparkinn.com or Reservations.parkinn@gmail.com. You can do it via fax: 007 343 216 60 06 as well indicating password: «LETO-2018».